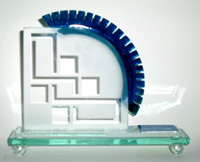 WIRE-Net (Westside Industrial Retention and Expansion Network) recently presented its Mission Builder Award. The award honors organizations and their leaders who exemplify the organization’s mission to strengthen manufacturing to create healthy communities and fuel economic growth. The 2006 award winner was Steve Peplin, CEO of Talan Products, Inc. Talan Products, a fully integrated manufacturer of high volume, high speed metal stamping products, recently moved from their w.68th address to the Collinwood area of Cleveland. The move allowed for the company’s continued innovation, reinvestment, and job creation. Since 2003, Talan’s employment has doubled and with this move, the company expects continued job growth and a 30% increase in sales over 2005. Talan understands the importance of innovation – and uses cutting edge staff development tools including Open Book Management and Lean manufacturing techniques to remain competitive. Accepting this award at our Innovation Celebration in Steve’s absence was Pete Accorti, himself a long-time WIRE-Net supporter and 2004 award winner.